It seems like only yesterday when the last retail set of 2017 was released. 2017S2 Battle of the Bands was a hit with collectors. A number of cards were very sought after as collectors focused on collecting their favorite bands. Its time for 2018 to get started with another complete shift in theme material. 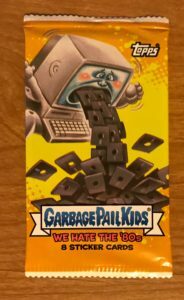 2018 Series 1 Garbage Pail Kids We Hate the 80’s is trying to hit collectors right in their childhood. Many collectors grew up in the 80’s, and this set’s focus is completely for them. While sticking with the same subset formula, Topps made it a bit easier this time around. The 180 cards set is broken down in to 10 equal subsets. Topps remains committed to the same formula they used for a number of years now. The cards continue to lack card back artwork, sticker die-cuts, checklists, and numbering is on the back. I will have articles looking at production numbers in the coming days. To see the official Topps checklist click here. 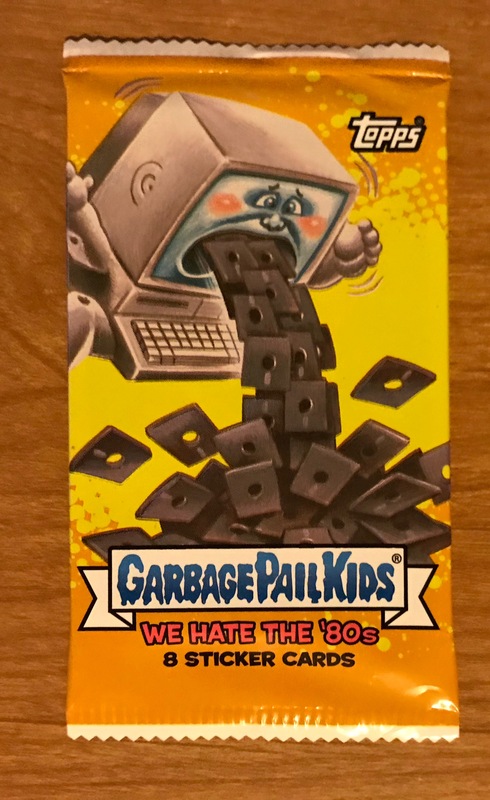 Here is what you can find, and where you can find it in 2018 Series 1 Garbage Pail Kids We Hate the 80’s. Base Set – 180 total cards made up of 10 different subsets. Parallel Sets – Same exact cards from the Base set, except with a different speckled color border. Insert Sets – All the various insert subsets that can be found in packs. This entry was posted in 2018 Series 1, Odds and tagged 2018S1, Odds by Jeff. Bookmark the permalink. What is the NPN address for Hobby Collector? You will want to check ebay completed listings, but that’s a great pull!